Disney seems pretty determined to crank out as many live action reboots of classic stories as they can, thanks to films like their live action ALICE IN WONDERLAND, CINDERELLA and BEAUTY AND THE BEAST doing so well. They’re not always updates of animated fare, or sometimes take the classic stories into interesting new territory, like with MALEFICENT or the upcoming re-do of MARY POPPINS. We were originally going to get a live action take on MULAN next fall, but that’s now been pushed back to make way for THE NUTCRACKER AND THE FOUR REALMS, based on “The Nutcracker and the Mouse” by E.T.A. Hoffmann. The first trailer now was released just a week after it was announced that director Lasse Hallström was being replaced with Joe Johnston, and the production would be undergoing major reshoots for at least a month… this after principal photography was finished Spring of last year. It’s hard to imagine a film this opulent and colorful having to do a month of reshoots, as the financial side of that can’t possibly be cheap. In fact we now should wonder just how much of what we see in the trailers will make it into the final cut of the movie. This sort of thing seems to be happening more and more in Hollywood, with news of Phil Lord and Chris Miller being replaced by Ron Howard on the Star Wars spinoff Han Solo movie called SOLO (which also underwent major reshoots), and Joss Whedon being brought in to finish JUSTICE LEAGUE (which also had several scenes re-shot and rewritten). There’s been more “director shifting” on films in the last year than I can ever recall hearing about before. 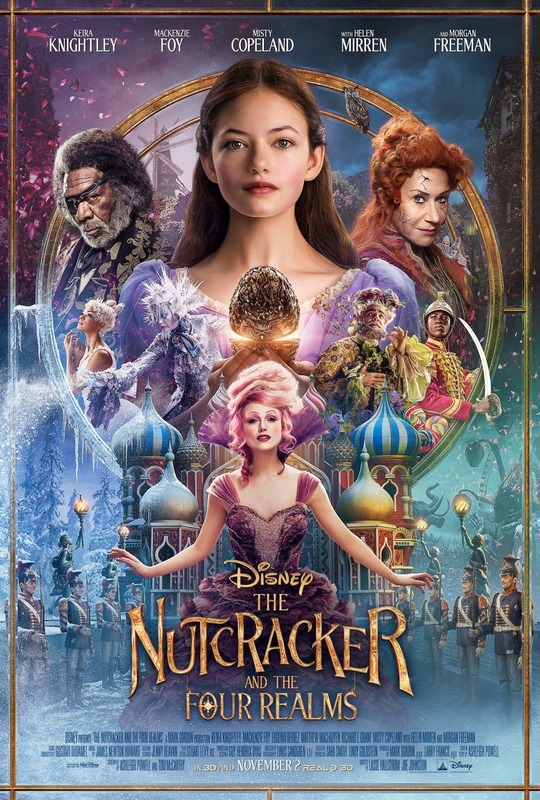 Oh well, for the time being, check out the new trailer for THE NUTCRACKER AND THE FOUR REALMS below, starring Keira Knightley, Morgan Freeman, Mackenzie Foy, Helen Mirren, Matthew Macfadyen, Miranda Hart, Richard E. Grant, Sergei Polunin, Jack Whitehall, Ellie Bamber, Eugenio Derbez, Meera Syal, Omid Djalili, Marian Lorencik, and Misty Copeland. It definitely feels like they’re going for an ALICE IN WONDERLAND look here, which might not be the smartest play, considering that despite the major box office earnings of the first film, most people really don’t look back on those movies very fondly. Tell us what you think about the trailer in the comments.